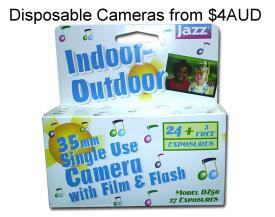 Do you own a Plastic Binocular to Tripod Adaptor? If you do, you would be aware of how wobbly they are! We have designed a new, rigid Binocular to Tripod Adaptor from aluminium. 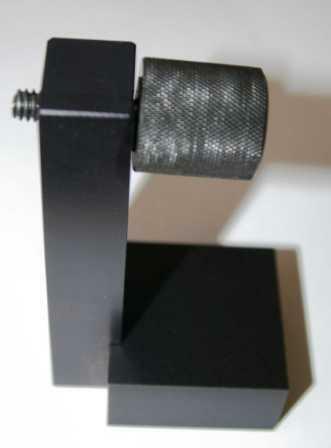 The Adaptor is Black Anodised, with a thick Knurled Knob for ease of use. $1900AUD - Don't pay $2499AUD at Andrew's Communications! 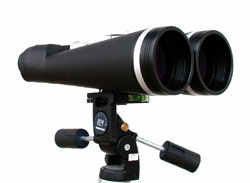 Introducing our large 25x100mm Astronomical Binoculars from Telescopes and Astronomy. 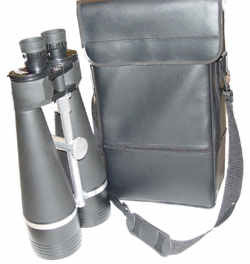 A number of improvements have been made over other big 25x100mm Astronomical Binoculars available. The 25x100 FB's have a better prism mount so that the front prism and rear prism are in much better alignment. Also, with the 25x100 FB prism housing, the objective tubes are in perfect parallel positioning with the eyepieces. The point is that, the better collimation, the minimum prism light cutoff and more even focus is achieved. Another major improvement is the blackened inside of the objective tubes. It doesn't use the common anti-dust paper with sticky oil which traps the dust and dirt - this makes the inside surfaces reflective and shiny. Instead, all internal surfaces of the 25x100 FB are sprayed with a non-reflective black paint before assembly to decrease the reflection and increase contrast. This feature is only seen in a few very high-end German and Japanese models. The 25x100 FBs are a rubber armored, all-metal body with hinged central bar as the mount. The design itself is more waterproof and shock-resistant than most of the giant binoculars available. Characteristics include individual focus, 4.6 kgs in weight and 44.6 cm long. Broadband multi-coated on all air-to-glass surfaces including the long surfaces of the prisms. Most importantly, the binoculars have accessible collimation screws. 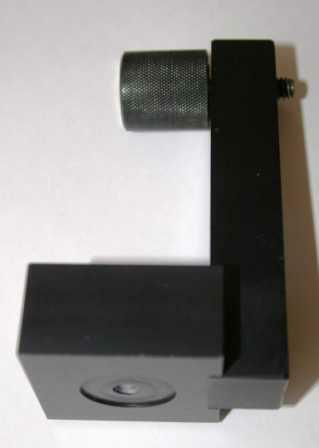 Many reviews tell how binoculars of this size arrive out of collimation (optical alignment). 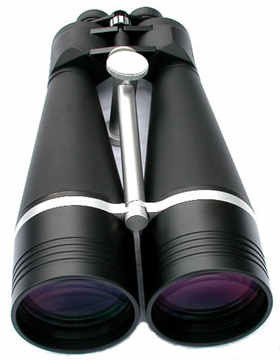 Collimation screws allow the perfect alignment of the binocular optics.